As privateers at sea you should definitely be armed - For the ancient pirate gun is idel. Disguise yourself with the pirate weapon as a wild pirate and go on the next Halloween party to plunder! 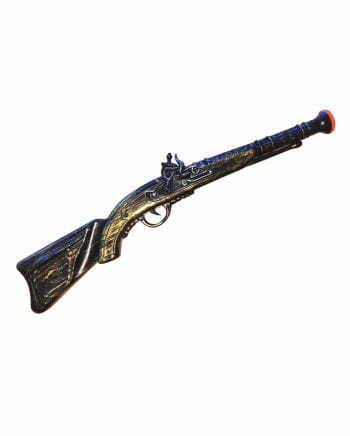 The ca.50 cm long toy gun can pull the trigger and you will hear this shot noise.The pirate weapon is kept in plastic and in black, gold and metallic colors.The antique-looking pirate gun is marked on Running as a toy gun, but can be painted for the theater and as a movie prop.With the Pirate Set with Pirate teeth and the matching Pirate Eye Patch with Skull is a mutiny nothing in the way. The item is a fancy dress accessory for adults and not a toy.Not recommended for children under 3 years.May contain small parts that could be swallowed - suffocation.